Hairline concrete cracks are tricky types of cracks that require a low viscosity resin to penetrate the entire length of the crack fully. 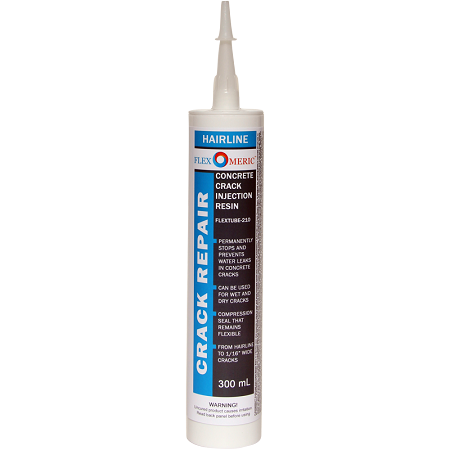 Our hairline DIY foundation crack repair kit offers the same professional materials that contractors use but made easy for any homeowner to use. When the concrete in your home develops a crack, it can be quite expensive to hire a professional to rectify the problem. Thankfully with FlexKit -200 Do it Yourself Kit, you can quickly seal cracks with simplicity and ease. The process involves the incorporation of high-grade injection resins which are fed into dry or wet foundation basement cracks. DIY FLEXKIT-200 Crack Repair Kit can be injected into an actively leaking or dry foundation wall crack as it chemically reacts with water and bond to concrete to form a water-tight, flexible gasket through the entire wall thickness, eliminating any future leaks, guaranteed. 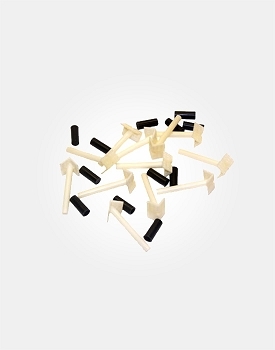 The kit offers customers with industry grade injection resins which have been simplified for use to make them more accessible to DIY enthusiasts. With this kit, you can easily repair 8' long, hairline concrete foundation crack that has up to 8" thick wall. 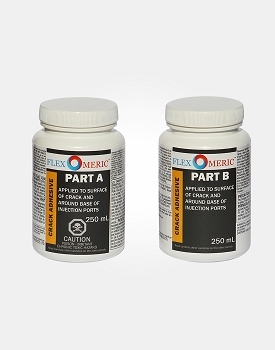 Additional FLEXTUBE-210 resin is available as an add-on for larger size cracks. Our Do It Yourself Crack Repair Kits ship free in USA and Canada. Place your order by 1:00 PM EST for same day shipping. Faster shipping options are also available and can be viewed on the checkout page after your shipping address is entered. Product worked well, definitely use a drop cloth though because a good application requires a lot of product forced out the holes. Take your time and make sure you have the surface covered well, the product is thin like water, which is good for hairline crack penetration but will definitely find any small holes in your surface coating. Stopped a stubborn foundation leak at my house, and had 1/2 the product left over on a hairline crack about 6' high. Would definitely buy again. 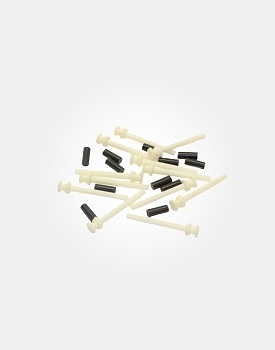 Would like to buy more injection ports, but shipping from Canada is so expensive it would almost be cheaper to buy a whole new kit to get free shipping than pay the $15 for injection ports + $25 shipping. Best stuff ever! The wall resin is so strong and adheres to cement like nothing I've ever seen before! The resin is very watery so it flows into the crack nicely and expands so well I can see it sealing the outside as well! Only down side are the caps for the T's. I used another system that used covers instead of inserts and they were way easier to do quickly - and with the great flowing resin here I ended up with a lot on my drop cloth. Wonderful compounds! Please get this into stores!! Generally, I like the product. The complication I had was leakage under the adhesive. Even though I believe I applied it thickly over the crack and around the ports, it did not completely seal to the concrete in a few places. The instructions say to stop and reseal the leak, but the wall must be completely clean and dry. So, that was impossible with the gooey filler leaking out. I covered the leaks with a finger while applying the rest of the filler but ran out within 12" of the top of the crack. Fortunately, the next day I could see the filler had expanded to the top of the crack. Overall, I believe I got the complete crack filled regardless of the leaks. I wish there was a reasonable solution to these leaks because they waste a lot of filler and 2 tubes was barely enough for a narrow crack 6 feet long. Instructions are clear and easy to follow. Great product and excellent services. It worked as advertised and expected.Delivery is very fast and support always available. Instructions are clear and easy to follow. Make sure you watch the YouTube video before start. Be patient and inject slowly. A lot cheapet and better than getting it done by contractors. No drilling and damage to the concrete wall. Quick delivery, I received the order the next day. The instructions are easy , if you follow them, you should not have big issues. 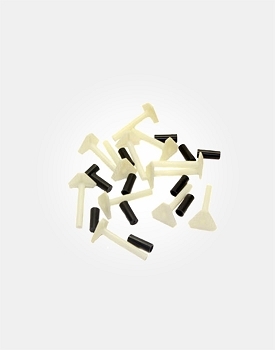 However, the polyurethane in this kit has very low viscosity, the gloves can be slippery if you get resin on them and putting the caps on the ports after injection can be tricky. I mentioned this to the technical support team which is very helpful and friendly. I also used the FLEXKIT-100 kit as my cracks are wider at the top of the foundation, the polyurethane in that kit is more viscous and it is easier to work with. So far, I haven't seen any leak after 2 heavy rains. I likely saved several hundreds of dollars! Q: Will this work on corner wall cracks? Q: I'm trying to patch 2 cracks in my basement concrete FLOOR. what's the difference between the 100 and 200 products? They should work on the floor, right? A: The FLEXKIT-100 is designed for repairing concrete cracks that are 1/16" to 1/2" wide, and the FLEXKIT-200 is designed for repairing concrete cracks that are hairline to 1/16" wide. 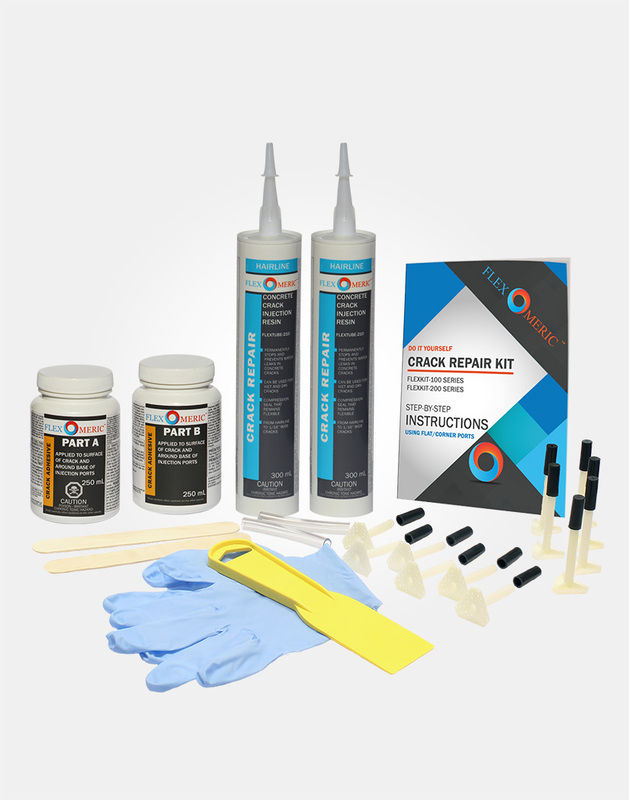 Yes, you can use these two kits for repairing concrete floor cracks. Q: I want the drill ports with my order why dosent it show up in my cart ? 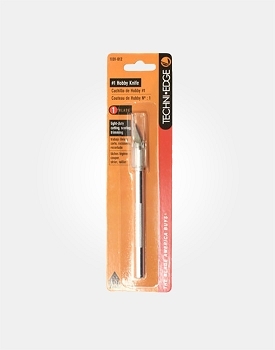 Techni Edge #1 Hobby Knife helps with chipping out loose concrete, dust and residue in concrete cracks to widen cracks for a cleaner passage for injection. 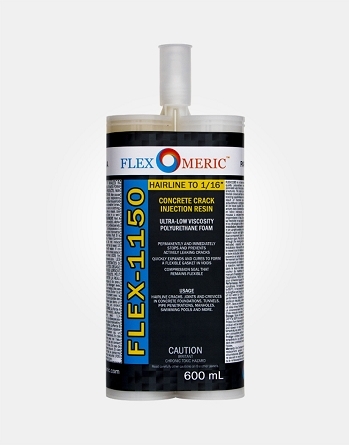 FLEX-1150 is a dual component, extremely low viscosity, high quality polyurethane injection resin. 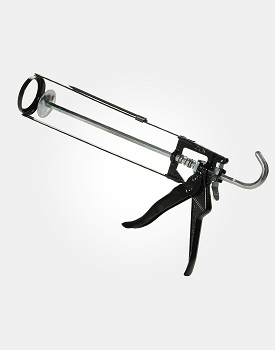 It is designed to permeate very fine cracks or joints in below grade concrete structures. 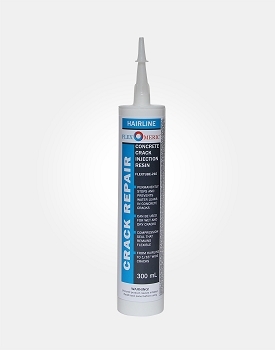 Flexomeric FLEXTUBE-210 Crack Repair Resin is a single component, premium quality crack repair resin designed to repair dry and active water leaks in various cracks or joints in below-grade foundation and concrete structures.